When I was a child, the word God was one of those words that adults either used in vain or in hushed tones. Outbursts of anger always included the word God. Strange and mysterious circumstances often resulted in the word God being used in hushed tones. I remember the very first movie I was ever taken to see. Bambi may have been a Disney movie, but when the shot that killed Bambi’s mother rang out, as far as my mother was concerned, I broke one of the ten commandments when I shouted, “Oh my God.” Mom warned me that when we got home there would be dire consequences for this offence which confused me to no end, because before the movie began, they did what they always did in back in the 1960’s, they played, “God save the Queen” as we all stood to attention. God’s name been sung out incurred no dire consequences. Words are strange things, capable of transcending time and space. Words are marvellous things, capable of transmitting wondrous ideas. Words are fascinating and I’ve spent most of my life loving words for all the marvellous things that they can teach me. But as a lover of words who makes her living using words to communicate about marvellous things, I know all to well the limitations of words. The Gospel of John, begins with words, they are the same words that the Book of Genesis begins with, “In the Beginning”. In Genesis the words are: “In the beginning God created.” In the Gospel of John the words are: “In the beginning was the Word”. The words in both of those phrases fail to capture the wonders that their authors are trying to express. These words can only hint at the images that lay beyond them. But these words do have the power to give us incredible hints of the wonders they struggle to express. If only we have ears to hear them, and eyes to see. Sadly, some of us never get past the words themselves. We see only what lies upon the surface of these words. All too often, we remain blind to the marvelous images that lie beyond the words. And for those of us who are fortunate to catch a glimpse of those marvelous images, we spend our days trying to find other words and images to reflect the wonders we have seen. It is no small thing that the writer of the Gospel of John chooses familiar words to begin his attempt to capture the light, which he or she has seen. “In the beginning was the Word and the Word was with God and the Word was God. The Word was present to God from the beginning. Through the Word all things came into being, and apart from the Word nothing came into being that has come into being. In the Word was life, and that life was humanity’s light—a Light that shines in the darkness, a Light that the darkness cannot overcome” mysterious words about the Word that lies at the very heart of existence. The writer of the Gospel of John isn’t fooling around, this is serious, mysterious business. The writer has something important to say, something that can only be heard if the listeners, or the readers harkens back to the very beginning, something so important that only the Words of Genesis will suffice to convey its magnitude. If you have ears to hear and eyes to see, you will notice the words of Genesis permeating the words of the Gospel as it is recorded in John, words of Genesis carefully designed to help the listener and the hearer to harken back to they mysteries revealed in the words of Genesis. So, when we hear or read the story about Jesus healing the blind, we would do well to look beyond the surface of the words so that we can see what is being said. There are all sorts of things I could tell you about the collection of words in chapter nine of the Gospel according to John. I could begin by telling you about the way the author groups together the various events into sevens to reflect the seven days of creation. These seven signs that Jesus performs coupled with the seven I AM statements Jesus makes add up to one thing and one thing only in the ancient mind. 7 + 7 = One, just as surely as you have two eyes in your head to see with. Jesus is the One. But the weaver of the tale according to John goes one very giant step farther than Genesis. This Jesus you see is not just your garden variety of light. (pardon the pun) This Jesus is the kind of light no darkness can over come. You’ll recall that in the tale told in Genesis, the Creator of all that is, reaches down into the dirt of the earth, grabs a handful of the dust of the earth to create an earth creature. From the dirt of the earth God creates them in God’s image, male and female, these clumps of dirt creatures. God breathes life into the earth so that we might live. So Jesus reaches down into the dirt of the earth, grabs a handful of mud and smears it on the blindness of one of these earth creatures so that we might open our eyes and see. “I AM the light of the world. Open your eyes and see!” What is it that the weaver of this tale wants us to see in Jesus? Are we to see a miracle, or are we to see beyond the pictures that the words paint, beyond the images of the miraculous to the One who IS the great I AM? Even as a child staring up at the screen, I knew there was so much more to what I was seeing than meets the eyes. “Oh, My, God.” If Bambi’s mother could die, my Mom could die. “Oh, My, God.” Even in Disney there’s more than meets the eye. So, why is it that when it comes to the words of scripture, we all too often limit our view to what meets our eyes upon the surface of the words. Why do we create an image of God, based on the surface of things? Why do we seem content to be Pharisees? “Who sinned? The one born blind or the parents of the one born blind?” That’s an important question if your image of God is based on what meets the eye. But for those who have eyes to see, there’s so much more than meets the eye. For those of us content with what the eye can see, there needs to be a culprit. Cause and effect need to be identified. So, we create an Insidious Idol to worship as our God. In our idolatry, we insist that this idol of our must exact justice as if it were a commodity to be bartered on the altar of life. “An eye for an eye and a tooth for a tooth, until the whole world is blind.” And yet in the Gospel according to John, we hear Jesus insist that it’s not about sin. Now before you go drawing an image of God that makes people blind so that others can see God. Let me stop you. 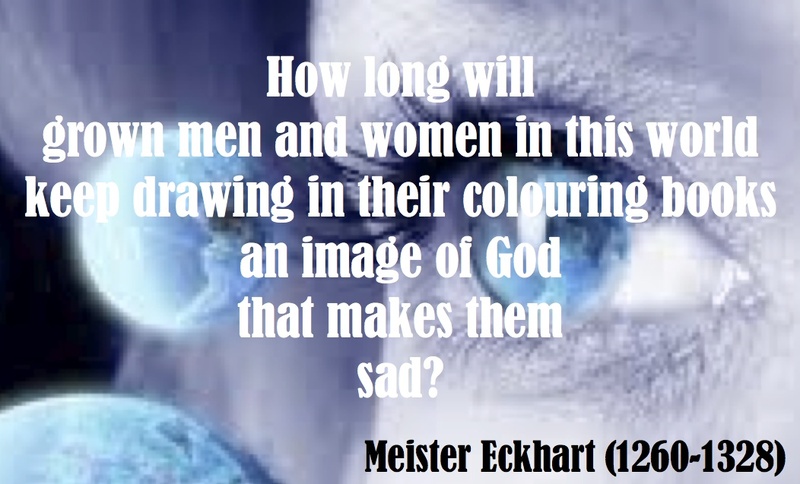 Let me stop you with the words of Meister Eckhart: “How long will grown men and women in this world keep drawing in their colouring books an image of God that makes them sad?” Surely any God worth worshipping would not be so cruel as to inflict actual physical blindness. Remember this is a story created to shed light. The point is not that that someone was born blind, the point is that we are to give up looking for cause and effect. The point is that our God cannot be imagined as a God of cause and effect. Our God is beyond cause and effect. The time has come to open our eyes and to see beyond the surface. To see deep into the heart of the mystery that is our God. Let’s colour outside the lines. Let’s draw an image of God that appears as a result of the beauty that surrounds us. Reach down into creation, grab some of the stuff of the earth, rub it into your eyes if you have to, so that you can see. See that God is God and not the image, the idol of your making, but God, beyond words, beyond images, beyond idols, God is God. Let there be light. Let the light shine. For in the words of Meister Eckhart: “It is your destiny to see as God sees, to know as God knows to feel as God feels. How is this possible? How?” Open your eyes and see. Eckhart puts it this way. “the greatest gift God can give is God’s own experience. Every object, every creature, every man, woman, and child has a soul and it is the destiny of all, to know as God knows, to feel as God feels, to Be as God IS.” Open your eyes and see. Stop colouring images of God that are too small. Begin to draw outside the lines. And when your done. Begin again. God is in the very fabric of creation. So open your eyes, look around, learn and know God. For you will see God in creation, and in God’s creatures. In the faces of your sisters and brothers you will see God It is here and now that we will see and learn and know our God. Let those with eyes see. Let those who have been blind be healed. Let there be light. Let that light shine through you. Stop colouring images of God that are too small. Begin to draw outside the lines. Open your eyes, look around, learn and know God. we will see and learn and know our God. Let those who have been blind be healed. Let that light shine through you. The light of God, who is beyond light. Creator, Christ and Spirit ONE. This entry was posted in Evolutionary Christianity, Progressive Theology, SERMONS and tagged emergent theology, emerging church, evolutionary christianity, Lutheran sermon John 9:1-41, Lutheran sermon Lent 4A, Meister Eckhart, progressive Christian sermon John 9:1-41, progressive Christian sermon Lent 4A, progressive christian spirituality, spirituality by Rev. Dawn Hutchings. Bookmark the permalink. Such a beautiful and insightful sermon! I am blown away with what I just read. Thank you for this sermon.